Kunghur and Midginbil, New South Wales countryside accomodation, Crams Farm, camping, birdwatching, activities and recreation. Kunghur weather and getting there. 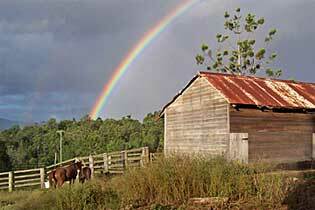 Close to Kyogle, Murwillumbah and Nimbin, NSW 2484, Australia. Like most rural settlements in the region, Kunghur and Midginbil were established when timber getters harvesting the sub tropical rainforests, cleared the way for diary and cattle farmers. Dairy and cattle farming remain the primary industries, with outdoor activities like bushwalking and birdwatching available at budget camping grounds around the district. Crams Farm Recreation Area via Midginbil, is the catchment for Clarrie Hall Dam, the primary water supply for the Tweed Valley. The entry gate is open from 7.30am - 5.30pm, and extensive facilities include under-cover free electric B.B.Q.s, picnic tables, amenities block and shelter shed. Or you can enjoy an open air fireplace, dotted around the wide open spaces, under the trees. An all weather cricket pitch and kiddies playground near the main BBQs, provides family fun in stunning scenery. A jetty and launch ramp (non motorised water vessels only) offers easy access to the upper reaches of the dam for canoeing enthusiasts and catch and release fishing. Bird watchers will be suprised by the number and variety of bird species they can spot on a leisurely stroll around the vast open space and along the shore of the upper reaches of the dam. The Mt Burrell General Store, with a petrol bowser out front for those low on gas, serves the Mount Burrell and Kunghur communities, and is well stocked with groceries and food basics, including a wide range of wheat and gluten free products. A fruit and vege barn is adjacent to the store, and offer a welcome place to stop and stretch your legs as you stock up on fresh local fruits and veges, while the Sphinx Rock Cafe offers alfresco dining while you admire the magnificent rural views, or groove out at their very popular Sunday arvo gigs, showcasing local talent. Three World Heritage Gondwana Rainforest listed properties are within easy drive. Wollumbin (Mt Warning) National Park is less than 30 minutes drive north, with the road following the meandering path of the Tweed River, while Nightcap and Border Ranges National Parks make for a pleasant full day driving tour to the south and west. Getting to the region is easy: Visitors can reach Kunghur and Midginbil by road, with air services available at Gold Coast Airport, Ballina/Byron Gateway Airport and Lismore Airport. Kunghur is about 10 hours drive north from Sydney via Kyogle, Lismore - Nimbin, on the Summerland Way, or via Murwillumbah and about 90 minutes drive south from Brisbane, on the Pacific Highway. Click to display a panorama (72kb) as seen from the Murwillumbah - Kyogle Road between Kunghur and Cawongla. Domestic flights operate from all capital cities to Gold Coast Airport at Coolangatta with a number of international carriers servicing SE Asia, New Zealand and the Pacific flying into this hub. Daily interstate coach services are available from Murwillumbah and Lismore to Brisbane, Sydney and Melbourne, and daily or overnight train service is available from Sydney to Brisbane at Kyogle. Visit Kunghur - Transport Services Information for more transport information, including trains, coach and local bus schedules, taxis, airport, and transfer services. Also check Lismore Transport Services and Nimbin Transport Services for additional options. Northern Rivers Carpool provides locals and visitors with the opportunity to share transport in the region.